L to R: Alex Skabardonis, Ali Haghani, Lily Bashar, ISR Director Eyad Abed, Pravin Varaiya and Wendy Abed. Photo by Jaimyoung Kwon, California State East Bay. 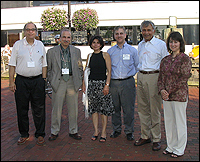 The 16th International Symposium on Transportation and Traffic Theory was held at the University of Maryland, July 18-21. It was organized by Hani Mahmassani, director of the Maryland Transportation Initiative.